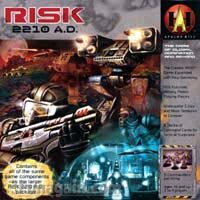 RISK 2210 A.D., an advanced version for RISK game fans ready for more strategic play, extends the theme 200 years into the future when the world's countries are at war. Players must outwit huge man-operated robots to rule underwater cities and moon territories. The game features over 400 futuristic game pieces and five different Commander card decks, delivering tactical surprises on two game boards. Other products in the "Risk" series. There can be a lot of downtime during other players turns, but an excellent game nonetheless. Best with three players. The game is longer with more than three even if all players are very experienced. If you are a fan of RISK, prepare to never want to play regular risk again! This game brings alot of new elements to the table. Extra dice, single shot cards with powerful effects and last but not least THE MOON! Also, you can take over underwater areas making this risk bigger and RISKier than the others. I seriously cannot go back to plain risk after tasting this one! My favorite of all the risk games...adds flavor and substance...a real blast if you like risk and the fun of having cards as well.